The average Daniel Cormier tickets will cost you $425 for the event being held on 03/11/2018 at Madison Square Garden, New York. The minimum get in price is $26 at Madison Square Garden. 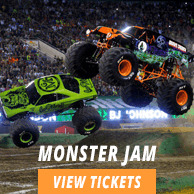 The Mandalay Bay Events Center located on the Las Vegas Strip is preparing an event that will have your adrenaline pumping. Ultimate Fighting Championship martial arts expert, Daniel Cormier promises to provide an astounding display of talent, skill, power and agility. All those who are die hard UFC fans are advised to grab their set of Daniel Cormier tickets as soon as they can to watch their favorite wrestler. With a capacity that can seat approximately twelve thousand audiences, the Mandalay Bay Events Center is known to host a variety of events from boxing matches to martial arts events and music concerts. Established in 2007, the facility was founded and is currently owned by MGM Resorts International and has hosted some of the most popular events that include becoming host to the Latin Grammy Award in 2007, 2009, 2010, 2011, 2012 and 2013. The vicinity has also provided its space to VH1 for its Rock Honors Ceremony in 2006 and 2007. Coming to sports' the Mandalay Bay Events Center has held boxing matches between boxers namely Zab Judah and Amir Khan for the Light welterweight unification title in 2011. Further WWE Raw also made its way to present the SuperShow in 2012. Over the years the venue has also become known for hosting UFC Events and since 2012 it has held over twenty five UFC fights. The facility also became host to the biggest weigh-in-show of the UFC in its history attracting almost ten thousand fans to the venue. This time, the Mandalay Bay Events Center is yet again hosting another UFC Event where Daniel Cormier will be seen showcasing his talent. Born in 1979, Cormier is a yet to be defeated martial arts' champion who previously competed as an Olympic wrestler. Entering the field in 2009, Cormier has won all of his wrestling matches up to date with thirteen wins, out of which five were won by knockout, five by decision and three by submission. Currently taking part in UFC's heavyweight division, the martial artist has been ranked at number 2 by the Ultimate Fighting Championship organization and number 4 by Sherdog. As an Olympic wrestler Daniel Cormier competed in the freestyle wrestling division. He won a gold medal during the Pan American Championships in 2002 and 2003 and a bronze medal during the Rio de Janeiro Pan American games of 2007 while also bagging a bronze medal during the Baku World Championships. With an orthodox stance when it comes to wrestling and martial arts, Cormier is also a brown belt in Jiu Jitsu. Obtaining an interest in wrestling in high school, Cormier became a Louisiana Wrestling State Champion with a career score of 101-9 with just two losses. During his university years, Cormier enrolled into the Oklahoma State University where he competed in NCAA Division I Wrestling. Ending his season as a runner-up, the wrestler pursued a professional career after graduating. Since then he has become a force to reckon with. Watch Daniel display his strength simply by getting Daniel Cormier tickets.